The Beauty Scoop: Don't Forget Your Vitamin C! Don't Forget Your Vitamin C! We all know how important Vitamin C is for a healthy immune system. But, do you know the benefits it has for your skin? Let us break it down for you. It's an antioxidant. When you hear "antioxidant," think anti-aging. Antioxidants, like Vitamin C protect the skin against free radical and environmental damage. It brightens. If you're looking to restore your glow, look no further. 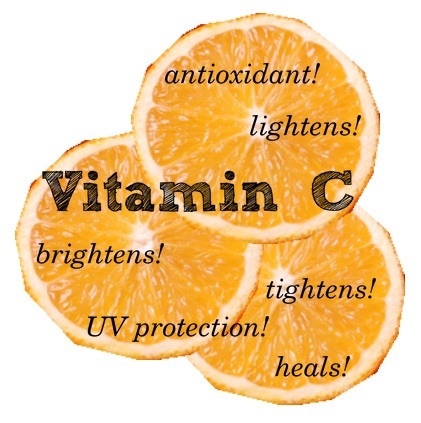 Vitamin C will brighten your overall complexion, improving dull or uneven skin tone. It lightens. Troubled by dark spots? Vitamin C will help lighten them, while protecting against further pigmentation issues. It tightens. Like we said before, it's anti-aging. It will tighten your skin by encouraging collagen growth - who doesn't want that?! It heals. Just like an internal dose of this vitamin is good for your health, a topical application helps heal blemishes, scars, and really, wrinkles and dark spots too. It increases sun protection. We always recommend using a broad spectrum sunscreen everyday. By using your Vitamin C in your morning routine, you will increase the benefits of your sunscreen so don't forget your Vitamin C this summer (and everyday)! Cosmedix Pure C: This innovative formula is 100% pure L-Ascorbic Acid Crystals so it is easily absorbed into skin for the most effective results. What's really awesome is that this powder formula can be mixed with any other skincare product for added benefits. iS Clinical Super Serum Advance+: This super hero serum utilizes time-released 15% L-Ascorbic Acid combined with Copper Tripeptide Growth Factors to enhance benefits. It also works great on stretch marks, and cosmetic surgery scars. Osmosis Skincare Catalyst: This award-winning hyperpigmentation serum with L-Ascorbic Acid uses Zinc Finger Technology to repair DNA damage. It also promotes overall skin health, while healing broken capillaries and preventing scarring. What's your favorite Vitamin C product? Let us know!